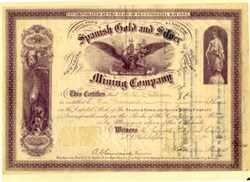 Beautiful certificate from the Spanish Gold and Silver Mining Company issued in 1865. This historic document has an ornate border around it with a vignette of an eagle and a mining scene. This item has the signatures of the Company's officers. The company was incorporated in Pennsylvania and had properties in the Big Creek Mining District, Reese River, Lander County, Nevada 1865.